This is a low detail version of Photon Fury just to get it to post on RVZ you can download the full version from the following link. 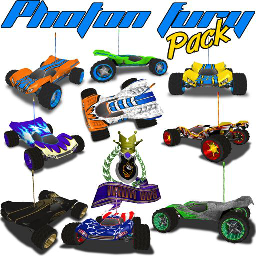 Photon Fury is a remake of my old Photon 5 car. It comes with three parameter sets and nine different paint schemes. Three are included on the Rookie version, three on the Advanced version and three on the Pro version. The paint schemes are compatible with all three parameter sets but you'll have to rename them before you move them to a different folder. Currently each version is in it's own folder, eventually I'd like to see a parameter file switch in RVGL similar to the paint scheme switch we have now. If this ever gets implemented I will update this car to utilize it.